Need an impressive holiday dessert that serves 20? Look no further! 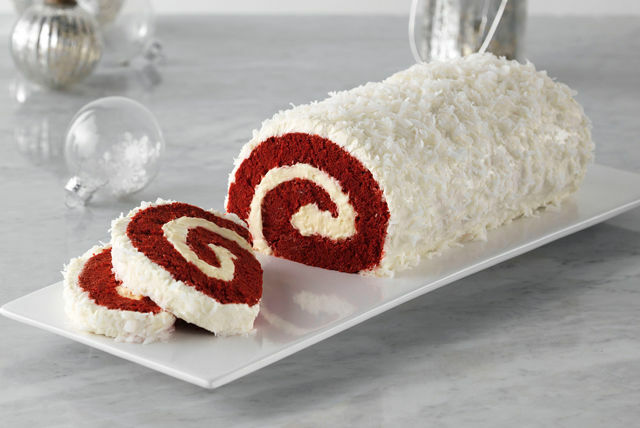 Red velvet cake, a vanilla filling and a delectable cream cheese frosting combine to make your holidays merrier. Place large sheet of parchment paper on clean kitchen towel; set aside. Spray 15x10x1-inch pan with cooking spray. Line with additional sheet of parchment paper; spray with additional cooking spray. Dust evenly with flour. Beat eggs in large bowl with mixer on high speed 5 min. (Eggs should be frothy and lemon coloured.) Add cake mix, water and oil; beat on low speed 30 sec., then beat on medium speed 1 min. Pour 3-1/2 cups batter into prepared pan; spread to evenly cover bottom of pan. Gently tap filled pan on counter to remove any air bubbles. Spoon remaining batter into 6 paper-lined muffin cups. Bake cake and cupcakes 15 min. or until toothpick inserted in centres comes out clean. Immediately invert cake onto prepared towel; remove pan. Carefully peel off parchment. Starting at one short side, roll up cake and towel together. Cool completely on wire rack. Meanwhile, transfer cupcakes to second wire rack; cool completely. Reserve cupcakes for another use. Beat pudding mixes and milk in medium bowl with whisk 2 min. Stir in 1 cup Cool Whip. Unroll cake; remove parchment paper and towel. Spread pudding mixture onto cake. Reroll cake; wrap tightly in plastic wrap. Refrigerate 30 min. Mix cream cheese and sugar in medium bowl until blended. Stir in remaining Cool Whip. Unwrap cake; place on platter. Frost with cream cheese mixture; sprinkle with coconut. Refrigerate 15 min. Savour the flavour of a slice of this festive yule log. At 20 servings, it's a great dessert to share at a party or family gathering during the holidays. For added convenience, this delicious cake can be baked ahead of time. Wrap rolled-up cake (without pudding filling) tightly. Freeze up to 1 month. Thaw in refrigerator before filling and frosting as directed.